A vintage birthday card today…but why does the title say thank you you’re asking? Well, I’m making this card as a thank you to My Favorite Things for their generous support of the Splitcoast Stampers Hope You Can Cling To Challenge for 2012. I was the very lucky recipient of $100 of MFT supplies and could not be happier! So today I’ve used some of my new goodies as a thank you…just to show that I am putting them to good use and they aren’t collecting dust…LOL! This card also fits the Ways to Use It Challenge at Splitcoast…new year…new toys. 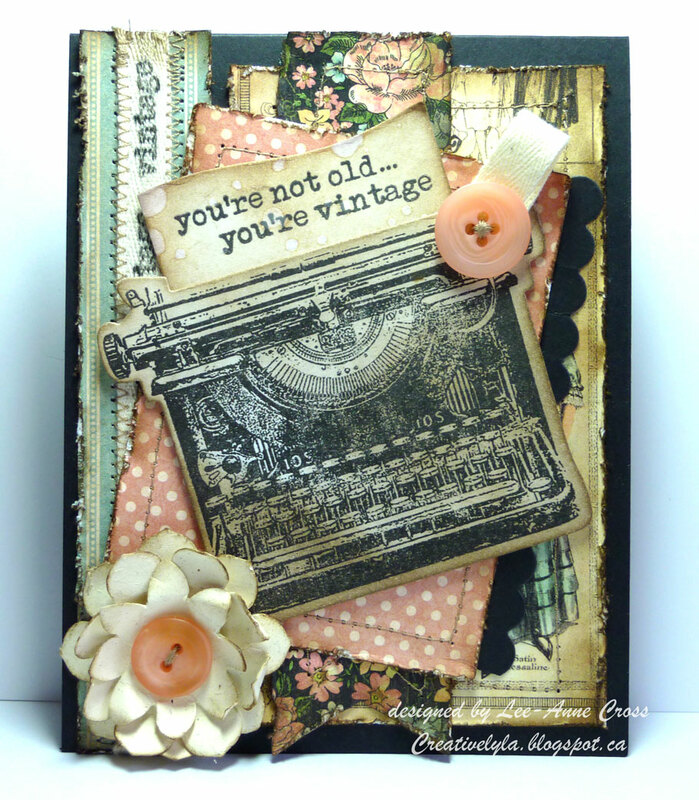 And, I’m entering this card in the MFT Guest Designer Contest for January. Today, my card starts with a standard A2 (4.25″ x 5.5″) card base in black. On the left side of the card is a strip of striped card stock. I’ve stamped the word vintage from the sentiment stamp down a strip of twill tape and then stitched it over top. To the right, a rectangle of coordinating designer paper that’s also been stitched. Next comes another piece of coordinating paper in a floral pattern. I used the MFT Die-namics Fishtail Flags STAX cut this piece and again, it was stitched. Then a rectangle cut with the MFT Die-namics LLD Insert-It 3 x 4 insert in a coordinating dot print, again stitched. I’ve used the MFT Die-namics Mini Double Dot Border for the little black border on the right side of the rectangle. The typewriter image was die-cut and stamped (you guessed it….the MFT Die-namics Just My Type Die & Stamp Set). The designer papers have all been distressed and inked. The little paper sentiment has been inked and then I added some water droplets for an aged paper look. The flower has been made with the MFT Die-namics Flower Medley. Love this set…so many fabulous shapes and sizes to make lots of different looks. A stitched button completes the center of the flower. Another little strip of twill topped by another stitched button is my only other embellishment. So happy you could join me today! Hope you are having a fantastic week! And a very big thank you to Kim at MFT for your amazing generosity!!! Oh Lee-Anne – this is true and pure perfection. I love all the fun distressed elements, and especially love the reason it was made. Very special! I went over to become a follower but seems I did that a long time ago. Gee Whiz…how did I somehow lose your blog? I think I've been too busy for a while and couldn't keep up. I have slowed down a bit, though. Whew! Hey there, Lee-Anne! I left you some love over at SCS but just HAD to come get the full effect of your card. I. LOVE. IT. You have one of the most creative minds when it comes to putting together multiple layers, and this card is no exception. LOVE the stamped twill ribbon and the flower, and your choice of papers is perfect! You've totally nailed this challenge! Congrats on such a large windfall – I love MFT! TFS! !